Village Infrastructure Angels (VIA) exists to provide rural villages in developing countries with the infrastructure they need to reduce poverty and improve living standards. This includes helping people access electricity for the first time. 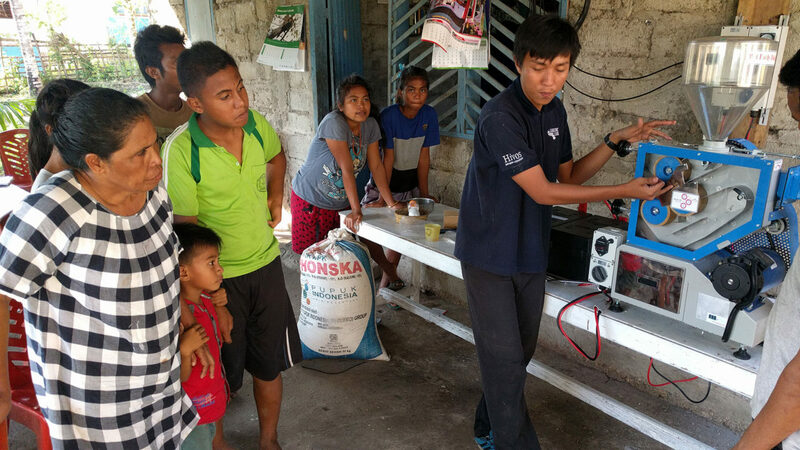 Smartly designed, technology, finance and IoT also has the capacity to supply power to an entire micro-energy infrastructure, including community assets such as mills. Labour saving assets have the potential to free 300 million women worldwide from one hour each day in processing crops, fetching water and collecting firewood. Those collective 100 billion hours every year could be used to generate additional income or to give more attention to other activities, for example, to children’s health and education. VIA, in partnership with the International Renewable Energy Agency (IRENA), began building projects in Vanuatu in the South Pacific – an area which is often overlooked due to its small size. With a population of approximately 250,000 people, half living in villages outside the main towns and spread over many islands, transport and communication is difficult and expensive. The country has also been hit by a series of catastrophic natural disasters, including earthquakes and one of the largest cyclones on record, which destroyed homes, crops and infrastructure. The mission of the local government is therefore to provide universal access to electricity and communication by 2020, and it relies on initiatives such as the projects built by VIA. One such project is the development of solar agro-mills for the country’s main crops which cannot be eaten without processing. Devices for any type of business need to be operational 100 per cent of the time, without the concerns or barriers caused by data, roaming, billing, management, or support. For organisations such as Village Infrastructure Angels, which is working on projects that can change the lives of some of the most deprived people in the world, this becomes critical. Agro-milling enables women in the area to reduce manual labour through cleaner, simpler, safer and quieter solar-powered micro-milling technology. The mills are leased to a local female entrepreneur using pay-as-you-go financial technology to create an affordable finance package. A mill therefore not only serves the needs of the wider community, it also becomes the entrepreneur’s livelihood. To deliver what the entrepreneur needs to run her business, it is essential the system includes technology which effectively measures the DC energy being consumed. Without this data, VIA cannot design the system to correctly charge the batteries to work for the length of time required. The system therefore needs connectivity – which is where the power of the Internet of Things (IoT) becomes imperative. Using a SIM card, the data can be automatically collected and sent directly to VIA. Vanuatu has several mobile network operators. A SIM could therefore be used from any local operator, and if the device is being used in an area which has coverage, it will work. The problem however is that no one operator covers the whole area. This means entrepreneurs leasing mills cannot be assured of their connectivity. With Eseye’s help, VIA has used this valuable technology to open a new chapter on how pay as you go solar technology can be applied in rural villages. We are now able to measure the daily power generation from solar panels and the daily power consumption via customers. This gives us a complete understanding of whether the service is being over or under-utilised so we can provision the system accordingly. VIA turned to IoT M2M connectivity specialist Eseye to deliver highly secure and reliable global cellular network data through its AnyNet Secure SIM. The AnyNet technology provides automatic routing onto up to 440 cellular operators in 190 countries and links seamlessly to the AWS Cloud. The SIM’s enhanced features also enable IoT devices to remotely and securely activate, provision, authenticate and certify devices or ‘things’, in field, over-the-air. Integration with AWS Cloud Services, further simplifies project set up and deployment by reducing the need for investment in specialist inhouse infrastructure and development resources. By adding AWS’ software tools and cloud the business establishes the means to simply and quickly analyse data and to scale instantly and securely, on demand. Eseye was tested amongst 15 suppliers – from the UK, to as far afield as Finland, Australia and China. We chose Eseye because it not only had the technical performance, but it was also cost effective. With the Eseye AnyNet solution, all that is required is one single SIM and connectivity to any network is available. This is especially important as we start to deploy the technology in other areas of the world. Because the project’s hardware requirements were not standard or available off-the-shelf Eseye supplied their AWS connected Hera 100 core module, adding peripheral sensor elements and application level software to the design.